They’d had some really nice cards. 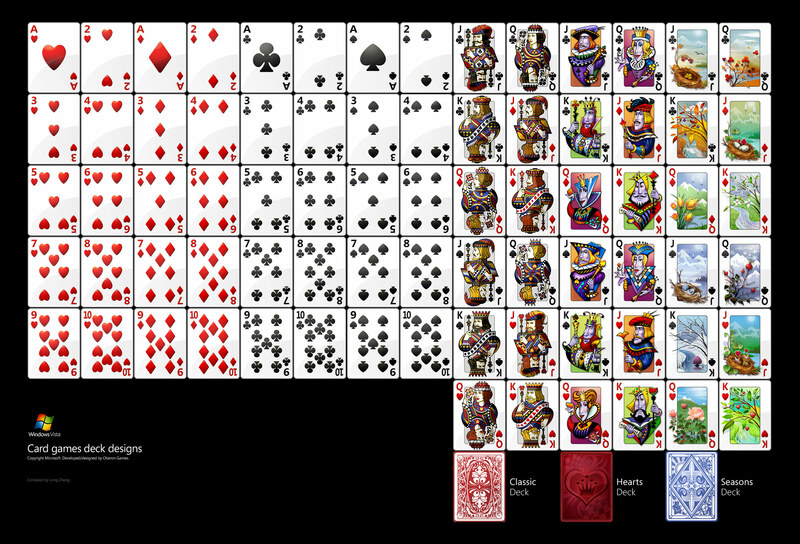 Windows Vista comes with 4 unique deck designs (3 pictured, Large Print excluded) for its bundled card games including FreeCell, Hearts, Solitaire and Spider Solitaire. Each deck portrays a unique theme (Classic, Hearts, Seasons) with unbelievable detail on card faces and backs. The Seasons deck by far is my favorite. I’m even playing Solitaire just to see these cards. Of course, these and every other games in Windows Vista are not actually designed by Microsoft internally, but outsourced through Oberon Games. Oberon designs many great looking games and have close ties with Microsoft, publishing many games through Microsoft’s casual games channels such as MSN Games and XBOX Live Arcade. With the former manager of Microsoft Game Studios, Don Ryan joining Oberon as Vice President of Publishing this year, this relationship can only strengthen. I don’t think it would be unfair to speculate Windows Ultimate Extras will deliver additional Oberon Games from time to time. Such as the long-forgotten Texas Hold’Em Poker we’ve known since Beta 2. Very sweet looking deck of cards! Yes they are! How long did that take? Gotta love the seasons deck, quite fancy! Hold ’em by Oberon, eh? That Texas Hold’Em, two player style game is the exact same version on the Comcast games network. It’s got great quality. they are VERY nice, I agree, just play the game to see the cards… I am planning to make a poster and hang it in my house, does anyone knows where I can find the cards of J, Q and K in bigger size/resolution? I would appreciate any help! thanks! Why Microsoft didn’t ask them to make a card game that require a joker???????????????????????????????? I miss the spider design on the deck for spider solitaire that was used in XP. BRING BACK THE SPIDERS!! Good news ! It’s really interesting,I already saw that. Sweet! The same cards are there on all Windows 7s, too! Some Casinos should take those designs. Can the seasons deck of cards be bought as a real deck? I’d love to buy some if it’s possible … can anyone help here? I think not. The closest thing to that you will find is this article. I think any print-on-demand service will have no problem printing those as real cards. It’s just need to be adjusted to the size of real cards without loosing the quality of the image, and be packed in boxes (if you order a large amount of card decks). Unfortunately there are no joker cards if its required for the games you need it for.